Blastocyst stage embryo transfer (ET) has become almost routine practice since the advent of sequential culture media. It allows a natural selection of best embryo for transfer with minimal human interference. Blastocyst transfer (BT), therefore, results in high pregnancy rate while minimizing the risk of multiple gestation. , Current practice involves culture and transfer of expanded blastocysts. However, it has been observed that extended embryo culture often produces several expanded-stage blastocysts and, therefore, it is practically difficult to select the best blastocyst out of the many available for transfer. Also, it has been observed that some blastocysts fail to hatch despite expansion of blastocoelic cavity and thinning of zona-pellucida (ZP). Embryos that develop to expanded stage in vitro may fail to hatch in vivo upon transfer. Hence, in vivo hatching of blastocyst seems to be the current rate limiting step restraining the criterion of selection of expanded blastocyst for transfer. Assisted hatching (AH) techniques have been attempted to circumvent this problem. However, as per guidelines laid down by Committee of American Society for Reproductive Medicine (ASRM), the method has restricted use due to its conflicting and inconsistent results. Discrepancies of AH techniques prompt toward use of an innate mechanism to allow in vitro hatching. Around a decade ago, few authors , reported high implantation and pregnancy rates with transfer of hatching/hatched blastocysts. Although the study  was limited by a small sample size (n = 6) yet, the pertinent observation of both studies was that waiting till day 6 would allow only good-quality embryos to hatch. Surprisingly, however, no studies on spontaneously hatching/hatched blastocysts have since then been undertaken and transfer of expanded blastocyst is still an extensively followed practice. Chances of success in assisted reproduction can be improved if embryo selection is based on naturally hatching status. Hence, a comparative study focusing on transfer of only in vitro spontaneously hatching/hatched blastocyst versus transfer of expanded blastocysts may not only aid in a better understanding of the implantation process per se, but also to evaluate comparative developmental and implantation potential of spontaneously hatching/hatched blastocyst as against expanded blastocyst transfer (EBT) in in vitro fertilization (IVF) cycles. In this prospective study, patients (n = 146; mean age ± standard deviation: 30.6 ± 3.9 years) underwent fresh cycle of conventional IVF between April 2008 and March 2011. BT was provided to all patients during a single IVF cycle. Donor egg and intracytoplasmic sperm injection cycles were excluded to avoid bias due to male factor, since it has been reported that male infertility significantly reduces blastocyst production. In case of severe male factor, donor sperm was used after obtaining written consent from the couple. Informed consent was sought from all patients for participation and our IVF center's institutional review board approved the protocol before beginning this study. After downregulation with gonadotropin-releasing hormone (GnRH) agonist or using standard GnRH antagonist protocol, controlled ovarian hyperstimulation with recombinant follicle-stimulating hormone (FSH) (recagon, 200 IU/day) was started from day 2 of cycle. Injection human chorionic gonadotropin (hCG) (fertigyn, 5000 IU) was administered when at-least two lead follicles reached ≥8 mm diameter. Egg collection was done between 34 and 36 h after hCG injection. Micronized progesterone injection (susten, 100 mg daily) was given to provide luteal phase support. Sperm sample was prepared by swim-up/density-gradient method and insemination was done 4 h after egg collection. A single team of embryologists coordinated all procedures, thereby ensuring that the culture protocols and embryo assessment were standardized. In all cases, culture was extended to blastocyst stage when more than two zygotes or at-least two good-quality embryos were available at cleavage stage (day 3). Embryos were cultured in sequential media (fertilization/cleavage/blastocyst media) in individual microdrops of 20 μL: From day zero to day 1 in fertilization media, day 1 to day 3 in cleavage media and day 3 to -day 5/6 in blastocyst media and incubated at 37°C in benchtop incubator with a triple gas mixture (6% CO2, 5% O2, and 89% N2). Embryonic development was monitored daily and microphotographic images obtained at a specific time till day of transfer. All 146 patients undergoing IVF with BT were sorted either into EBT or spontaneously hatching/hatched blastocyst transfer (SHBT) groups. Out of 73 women in each group, four patients in SHBT group and two patients in EBT group could not be offered BTs due to nonformation of blastocyst on account of arrest of embryos at eight-cell or morula stage or failure in hatching even on day 7 of extended culture. Hence, results were compared among 71 women in EBT group and 69 women in SHBT group. Group A (n = 71): EBT group: Transfer of fully expanded blastocysts defined by presence of >50% blastocoelic cavity with thinning zona, identifiable, compactly organized inner cell mass (ICM) and ≥50 trophectodermal (TE) cells on day 5 of extended culture [Figure 1]. Group B (n = 69): SHBT group: Transfer of partially hatched (TE cells emerging out of zona giving it a dumb-bell shaped appearance [Figure 2]a or completely hatched zona-free blastocyst [Figure 2]b on day six of extended culture. Embryos were examined on morning of day 5 and the time of transfer of expanded blastocysts in EBT group was decided. Blastocysts in SHBT group were cultured further till sign of spontaneous hatching or completely hatched status was seen on morning of day 6. On day of transfer, all patients were offered either elective single blastocyst transfer (eSBT) or two blastocyst transfer (2BT). Final decision on number of blastocysts transferred was taken by the couple. All embryos were microphotographed before transfer and total time in hours from insemination to transfer was noted. Transcervical ET was performed using soft-tipped Cook's catheter in both groups. Immediately after transfer, catheters were flushed and media was examined microscopically to confirm absence of embryos. Serum β-hCG on day 14 of ET indicated pregnancy outcome. Clinical pregnancy was confirmed by presence of gestational sac with positive cardiac activity. Hatched blastocyst: Blastocyst completely escapes from zona. For blastocysts graded as 3-6, development of ICM was assessed as follows: A-tightly packed, many cells; B-loosely grouped, several cells; and C-very few cells. The trophectoderm was assessed as follows: A-many cells forming a cohesive epithelium; B-few cells forming a loose epithelium; or C-very few large cells. Comparisons were made using unpaired Student's t-test, Chi-squared analysis, and Fisher's exact test, where appropriate. P < 0.05 was considered statistically significant. Results are expressed as mean ± standard deviation. Pearson's correlation coefficient (r) was evaluated to find correlation of blastocyst status and number with implantation rate (IR) in both groups. Biostatistical package Graph-pad prism (version 5.0) was used. 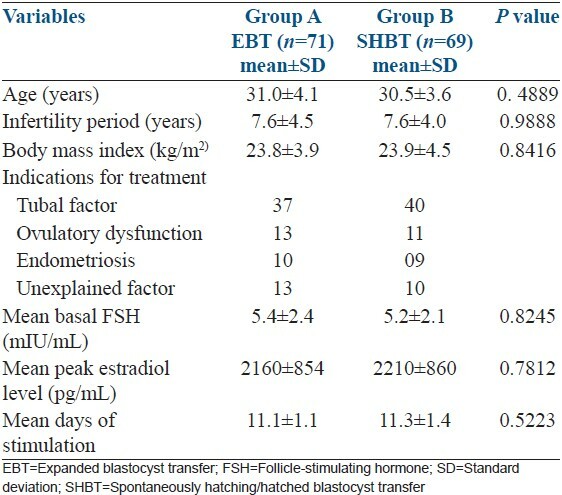 No statistically significant difference in such variables as age, body mass index, infertility period, indications for treatment, mean baseline FSH level, number of days of stimulation or mean peak estradiol level on day of hCG was observed between the EBT and SHBT groups [Table 1]. 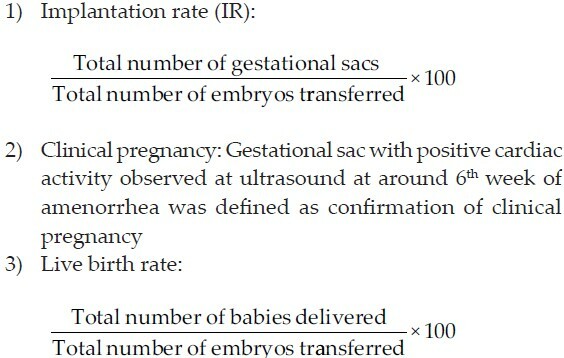 Embryological data and ultrasonographic findings between the two study groups are represented in [Table 2]. Consistent with better quality blastocysts obtained in Group B, clinical pregnancy rate (CPR) and IR in group B (SHBT) was significantly higher than in group A (EBT) (CPR: 59.4% vs. 45.1%, P = 0.0173 and IR: 43.6% vs. 27.9%, P = 0.0408, respectively). Multiple gestation rates were comparable and did not differ significantly between the two groups (24.4% vs. 18.8%, P = 0.4777). However, live birth rate was significantly much higher in SHBT group compared with EBT group [(43/117) 36.8% vs. (31/136) 22.8%, P = 0.003]. The per-cycle live birth rate was much higher and differed significantly between the SHBT and EBT groups [62.32% (43/69) vs. 43.66% (31/71) respectively (P = 0.027)]. An extremely strong correlation of implantation with top-quality embryos was observed in SHBT group (Pearson r = 0.4441), while it was nonsignificant in EBT group. Conversely, correlation of implantation with number of embryos was significant in EBT group (Pearson r = 0.2573), whereas it was nonsignificant in SHBT group [Table 3]. This is the first ever study involving exclusive transfer of spontaneously hatching/hatched blastocyst/s. Our results demonstrate that SHBT gives a distinct and significantly higher clinical pregnancy, embryo implantation, and live birth rate compared with EBT. 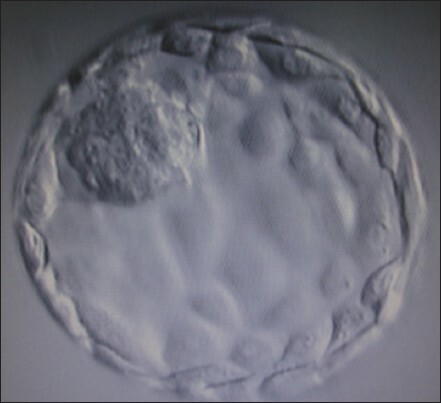 Though an earlier study  had concluded that hatching of embryos by day 6 is a favorable prognostic factor for IVF outcome; it was a serendipitous finding since culture was extended till day 6 due to unavailability of best blastocyst for transfer on day 5 when most of the embryos were still in morula or early blastocyst stage. Another study  reported similar results with a larger sample group. However, both studies involved transfer of at least one hatching/hatched blastocyst along-with at least one nonhatched blastocyst rather than exclusive transfer of hatching/hatched blastocysts. Our results remove any ambiguity arising from earlier studies, clearly indicating that spontaneously hatching/hatched blastocyst and not expanded blastocyst should be the selection criterion and can be the most favorable prognostic factor for positive pregnancy outcome in assisted reproduction. It has also been observed that the decisive morphometric characters described by Gardner et al.,  such as volume of blastocoeleic cavity, composition of ICM and number, and texture of trophoblastic cells (TE) that help to select the best embryo, generally do not appear by day 5 at pre-or early-blastocyst stage. Notably, our study for the first time reports that expanded blastocysts are formed only when the culture is extended beyond day 5. This additional time facilitates the slow growing day five morula/blastula stage embryos to develop into blastocysts and also facilitates compaction of ICM, increase in TE cells and enhancement in volume of blastocoelic cavity resulting in thinning of ZP. Another interesting finding of this study is that 117 of the 400 blastocysts (>29%) formed in SHBT group, started hatching, or were completely hatched by extending the culture just over 6 days, which is slightly higher than the 25% reported by Gardner et al.,  Thus, it may be assumed that over 70% blastocysts fail to hatch in vitro and get entrapped within the zona. Such blastocysts, if transferred, may also fail to hatch in vivo, hampering implantation and pregnancy rates. It is noteworthy to mention that fast cleaving embryos do not necessarily extrapolate to blastocyst formation as about 70% of them are chromosomally abnormal and arrest before developing to the blastocyst stage. , Schiewe et al.,  observed that genetic abnormalities of the embryo, suboptimal culture conditions, and abnormalities of ZP may lead to failure in in vivo hatching and the implantation process becomes difficult or even impossible. Another study  concluded that about 35% of top class expanded blastocysts are aneuploid and may not succeed to hatch in vivo resulting in implantation failure. In the absence of preimplantation screening data, it is reasonable to assume that in both groups in our study, embryos that progressed to become blastocysts and subsequently implanted were genetically ''normal.'' This conjecture is further substantiated by reports stating that embryos selected for transfer on day 5 or day 6 will carry a lower risk of being aneuploid, thereby increasing a patient's chances of achieving an ongoing pregnancy. These findings again reinforce our predilection toward transfer of spontaneously hatching/hatched blastocyst over expanded blastocyst to avoid presumably aneuploid blastocysts and increase implantation rate. An extremely strong correlation of IR with top-quality blastocysts in SHBT group obtained in our study is authenticated by reports claiming that chances of success in assisted reproduction can be improved if embryo selection is based on hatching status. The fact that number of embryos transferred really did not matter in SHBT group, emphasizes the relevance of quality over quantity. Therefore, transfer of fewer number of top quality blastocysts in SHBT group gave better pregnancy/live birth rates than EBT group where comparatively higher number of embryos was transferred. Mullin et al.,  recently reported higher implantation rates in patients who chose a single blastocyst transfer (eSBT) over double blastocyst transfer. No statistically significant difference in multiple pregnancy rates observed between the two groups in our study suggests that it may be prudent to transfer single hatching/hatched blastocyst and to avoid multiple pregnancy without compromising high implantation rates. The present study, thus, allows us to define new end points as regards time of transfer, number of blastocysts transferred, implantation rates, and IVF success. Our study confirms that extending blastocyst culture by few hours allows better developed, top-quality hatching/hatched blastocyst for transfer which subsequently improves implantation and pregnancy/live birth rates with no added risk of multiple pregnancies compared with EBT. 1. Gardner DK, Schoolcraft WB, Wagley L, Schlenker T, Stevens J, Hesla J. A prospective randomized trial of blastocyst culture and transfer in in-vitro fertilization. Hum Reprod 1998;13:3434-40. 2. Garcia-Velasco JA, Simon C. Blastocyst transfer: Does it really affect the outcome? Curr Opin Obstet Gynecol 2001;13:299-304. 3. Fong CY, Bongso A, Ng SC, Anandakumar C, Trounson A, Ratnam S. Ongoing normal pregnancy after transfer of zona-free blastocysts: Implications for embryo transfer in the human. Hum Reprod 1997;12:557-60. 4. Practice Committee of the Society for assisted reproductive technology, Practice Committee of the American Society for Reproductive Medicine. The role of assisted hatching in in vitro fertilization: A review of the literature. A Committee opinion. Fertil Steril 2006;86 (5 Suppl 1):S124-6. 5. Khorram O, Shapiro SS, Jones JM. Transfer of nonassisted hatched and hatching human blastocysts after in vitro fertilization. Fertil Steril 2000;74:163-5. 6. Yoon HJ, Yoon SH, Son WY, Im KS, Lim JH. 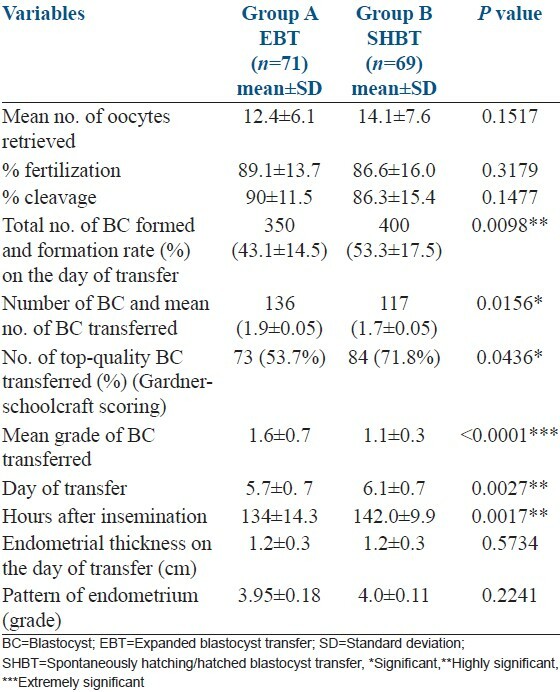 High implantation and pregnancy rates with transfer of human hatching day 6 blastocysts. Fertil Steril 2001;75:832-3. 7. Jone GM, Trounson AO, Lolatgis N, Wood C. Factors affecting the success of human blastocyst development and pregnancy following in vitro fertilization and embryo transfer. Fertil Steril 1998;70:1022-9. 8. Sher G, Herbert C, Maassarani G, Jacobs MH. Assessment of the late proliferative phase endometrium by ultrasonography in patients undergoing in-vitro fertilization and embryo transfer (IVF/ET). Hum Reprod 1991;6:232-7. 9. Veeck LL. Preembryo grading and degree of cytoplasmic fragmentation. An Atlas of Human Gametes and Conceptuses: An Illustrated Reference for Assisted Reproductive Technology. New York: Parthenon Publishing; 1999. p. 46-51. 10. Gardner DK, Lane M, Kouridakis K, Schoolcraft WB. Complex physiological base serum-free culture media increase mammalian embryo development. In: Gomel V, Leung PC editors. In vitro fertilization and assisted reproduction. Bologna: Monduzzi Editore; 1997. p. 551-4. 11. Magli MC, Gianaroli L, Ferraretti AP, Fortini D, Aicardi G, Montanaro N. Rescue of implantation potential in embryos with poor prognosis by assisted zona hatching. Hum Reprod 1998;13:1331-5. 12. Sandalinas M, Sadowy S, Alikani M, Calderon G, Cohen J, Munne S. Developmental ability of chromosomally abnormal human embryos to develop to the blastocyst stage. Hum Reprod 2001;16:1954-8. 13. Schiewe MC, Araujo E Jr, Asch RH, Balmaceda JP. Enzymatic characterization of zona pellucida hardening in human eggs and embryos. J Assist Reprod Genet 1995;12:2-7. 14. Staessen C, Platteau P, Van Assche E, Michiels A, Tournaye H, Camus M, et al. Comparison of blastocyst transfer with or without preimplantation genetic diagnosis for aneuploidy screening in couples with advanced maternal age: A prospective randomized controlled trial. Hum Reprod 2004;19:2849-58. 15. Friedler S, Schenker JG, Herman A, Lewin A. The role of ultrasonography in the evaluation of endometrial receptivity following assisted reproductive treatments: A critical review. Hum Reprod Update 1996;2:323-35. 16. Fanchin R, Righini C, Olivennes F, Taylor S, de Ziggler D, Frydman R. Uterine contractions at the time of embryo transfer alter pregnancy rates after in-vitro fertilization. Hum Reprod 1998;13:1968-74. 17. Mullin CM, Fino ME, Talebian S, Krey LC, Licciardi F, Grifo JA. Comparison of pregnancy outcomes in elective single blastocyst transfer versus double blastocyst transfer stratified by age. Fertil Steril 2010;93:1837-43.